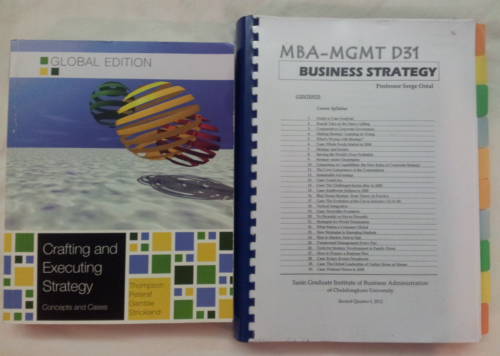 One of the reasons for me to do an MBA is that I wanted to learn more about strategy. In earlier jobs I noticed a few times already that it was pretty easy for me to simplify, improve, and streamline processes but as soon as I was done with that I always had trouble deciding on how to go further. In short you can say I was pretty much focused on the operational part and lacked the big picture, something that would be the key during the course Business Strategy with Serge Oreal. Even though the exam is open book you still need to open the books well before the exam to prepare the cases. When preparing for the first class I noticed in the reader that active participation was required for this course and in a way I already felt sorry for the professor because the level of participation so far in other classes has been pretty low. To my surprise this had changed totally overnight since at least 10 people engaged in discussions during the first class alone already, and from there on the level of participation only increased. 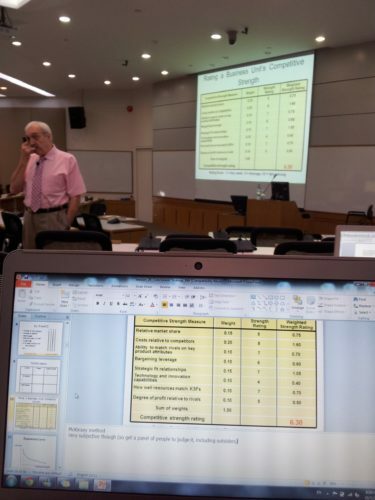 Apparently many people had asked the Sasin MBA class of 2011 for advice how to approach this course and they all mentioned you would be screwed if you missed out on too many points of the possible 20 points you could score with participation. 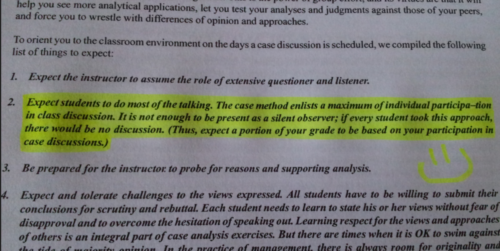 I LOL’ed when I first came across this, but was proven wrong on the first day of class. This course was our first course where we were supposed to prepare cases upfront to be able to discuss them during class. Do not worry about this though since this class is mostly, as professor Oreal puts it himself, “organized common sense”. Groups also present cases almost on a daily basis starting from the 2nd week on and we were supposed to write up a total of 2 cases which were graded. And if that was not enough already we not only had a final exam but also a strategic analysis report of about 15 pages requiring lots of research. All together I can say it was a lot of work, and I had never spent this much time on a course so far this year at Sasin. The huge amount of time we spent on this course resulted in the fact we learned a lot from professor Serge Oreal (who is from France by the way, but do not expect a strong French accent like Rene in the comedy “Allo allo”) during the 6 weeks, even though I must say that the case presentation did become a bit boring after a while; the first few were interesting and surprisingly good but after that they all seemed to be covering the same points and were structured nearly identical. As individual cases I did case 8 and case 15. Grades were normally given in the range of 3 to 4.5 for the first case and 3.5 to 5 for the second case. 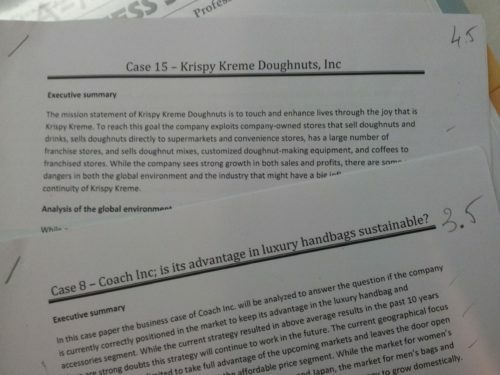 For the final report we had to prepare a complete report like we did before with the written case reports, the only big difference now is that there was no case to base everything on so we had to find and approach a company ourselves for information and strategic insights. This sounded very troublesome to me since I could hardly imagine how to approach a similar issue back home in Holland since it is not easy for a group of students to plan a meeting with an executive of a large company. In Thailand it is apparently a bit easier, also because most people in the class are well connected; with other words, their dad is often an executive or their family is one of the owners of a large company assuring you can have access to all the information you need. 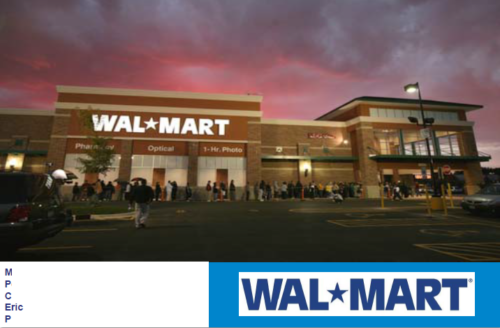 Case 22 we had to present; notice the dangerous looking clouds over this Wal-Mart store… Without our advice they are doomed. Waiting for our final grade will probably be a long sit since the final exam was an open book exam where most people typed, at least, 6 pages to answer the questions and the final team report can have up to 15 pages. But so far I am not worried since I have the feeling we will score pretty well on the group report which will represent 40% of our grade; big thumbs up to my team members for the hard work! Is a Sasin MBA something for you?